For those that have grown up on the Washington Coast, razor clam digging is a common pastime that evokes many joyful memories. No matter the weather, locals in Grays Harbor and surrounding areas pull on their boots, grab their shovels and head to one of the many scenic beaches to dig their limit of clams. However, for those unfamiliar with the area, the thought of digging clams in the sometimes inclement weather at all hours of the day may seem like a foreign thought. That�s why we've put together this razor clam digging guide to help visitors to the Washington Coast feel well equipped to conquer this unique adventure sport. There are 10 different types of clams in Washington State, however Grays Harbor beaches are known for their razor clams. Razor clam tides usually begin in the early fall and occur sporadically through May with summer considered the clam digging off-season. Shovels are commonly used on the beaches, although specialty crafted clam guns are a popular choice for diggers. Multiple stores in Grays Harbor carry these supplies for purchase or rent, including: Dennis Company, ACE Hardware, Buck�s Bikes and more. Use a bucket or net to place clams in while on the beach. A cooler full of ice is also convenient to store your harvest in during the drive home. Plan to arrive about an hour before the lowest tide in order to give you the most time to dig. The simplest way to pinpoint where to begin digging is to look for crowds gathering along the beach. Once you're in the general area where crowds are aplenty, keep your eyes peeled for small bubbles or depressions in the sand. This is a strong indicator that a razor clam is directly below and a good place to begin your dig. Razor clams are usually found about six inches beneath the surface. They move very quickly when disturbed, so be sure to dig rapidly once you break the sand so that the clams don't sneak away. Always clean out your razor clams upon returning from the beach. Clams must be cleaned before being cooked. Once cleaned, clams will keep fresh in the refrigerator for approximately three to four days and four months in the freezer. Learn how to properly clean razor clams by watch this video. There are dozens of recipes on how to prepare razor clams. From creamy chowder to deep fried delicacies, there's no shortage on how to incorporate razor clams into a delicious meal. Check out this list for inspiration on how to whip up a dish that's sure to impress your friends and family. Never turn your back to the ocean. As we all know, the ocean is unpredictable, so try to stay facing the ocean in order to quickly notice any approaching waves or floating debris. If the clam tide takes place in the evening or early morning, bring along a waterproof flashlight, lantern or headlamp to be able to see clearly where you�re digging and any hazardous conditions or obstacles on the beach. Always dress warmer than you think. The Pacific Northwest weather can change abruptly, especially at the beach, so warm clothing and waterproof outer layers are important. Gloves and water-resistant shoes are also recommended. Layers can always be removed if you work up a sweat! When bringing children along, be extra cautious. Keep your little ones within sight at all times. Once you�ve completed your dig, always refill any holes that you've created. Park your vehicle far back on the beach. Although you may begin digging at low tide, the ocean water will gradually creep further up the shore. The last thing anyone wants is to lose their vehicle to the unforgiving ocean. A permit is required for each person clam digging. There are two types available; an Annual Razor Clam permit that�s valid for 365 days and a Three-Day Razor Clam permit. These licenses can be bought at many Grays Harbor businesses such as: Big 5 Sporting Goods, Bi-Mart, Dennis Company, Walmart and others that can be found here. Razor clams are limited to the first 15 harvested, regardless of the size or condition, so always keep what you dig. Beaches may be closed for one of two reasons: conservation of the clams ensuring that overharvesting does not occur or the detection of high toxins that make consuming razor clams dangerous. Not all coastal beaches get approved by the Washington Department and Fish and Wildlife. Be sure to check which beaches are open prior to venturing out as tides may be cancelled without much notice. Most importantly, have fun! 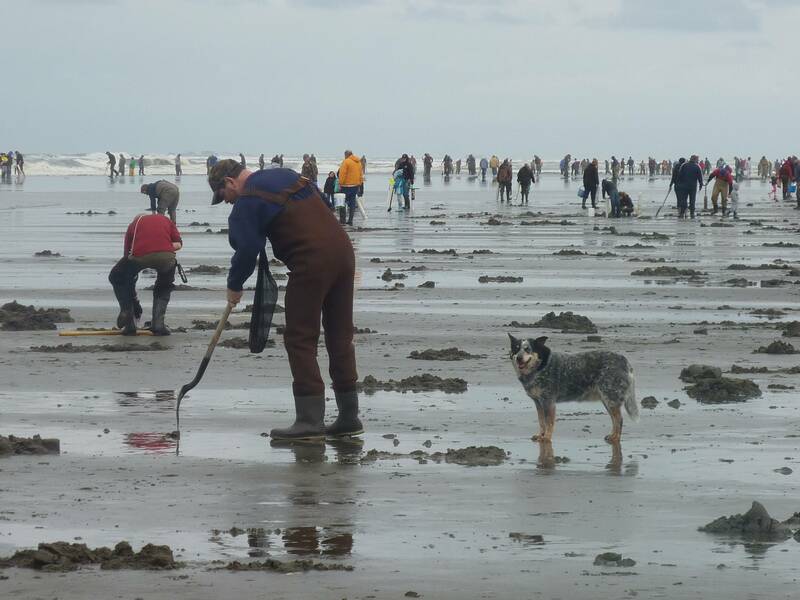 Razor clam digging is one of Washington State's most unique and wonderful activities. Don't hesitate to contact us with any questions to help make your experience enjoyable!